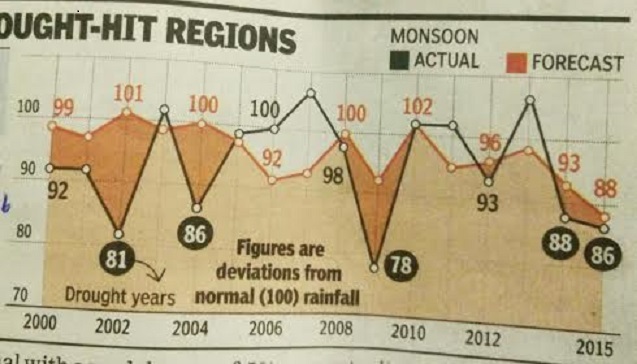 The Crucial 2016 Monsoon ! 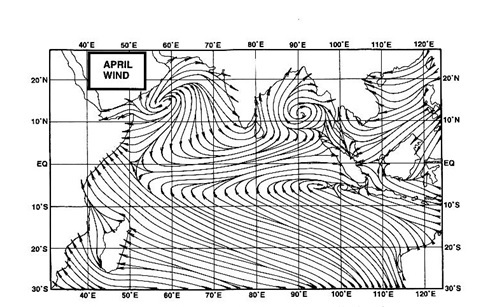 Even though the South West Monsoons are about 4 days late in making a "mainland" entry, most forecasts are of excess rains , and some forecasts showing a 109% excess, which would make it the best Monsoon after 1994. How have the "Forecasting" skills performed in the last 15 years ? Excess of 109% means 9% more than the 50 year average of 89 cms. A deficient of more than 10% is equivalent to a drought. 2015 was 14% deficient and 2014 12% deficient. Then, over the last 30 years, some state or another shows a 10% deficiency in any given year, and we do have isolated droughts in pockets. But the majority states in excess of 10% less rains, and declared as a National drought Year, are shown in a Yellow Square. After 2 consecutive droughts, the fields are parched and the wells have dried up. The Monsoon this year must be bountifull and well spread and sparsed out with evenly distributed rainfall. The water shortage this year is acute, and we need rains as soon as possible. Rains MUST cover the entire Peninsula area in the next 15 days. India is hoping for a return to normal monsoon , as 800 milion farmers, half of India's crops and 18% of the economy depends on the Monsoons ! A good rainfall year will boost the economy as a whole. Marathwada is one of the worst affected regions. Reports dirctly form their speak of very very low well (tube) levels, and all the earthen dams are dry. Officially, as per the Water resource dept of the Govt, the levels in all but 2 dams and reservoirs are below drawable levels, and there is less than 1% storage left. Fields are parched, and the farmers and locals look and wait for the first pre monsoon showers, to begin with. Sir, I had never faced water scarcity till now and hope to never face it in future.Hope and wish for bumper rains whole over the country. So Monsoon needs to set any how in Maharashtra by 15 June and hope second half of June gets copious rain!! seems forecast didn't predict any of the drought accurately. In the 16 years data from 2000 to 2015, 8 years are showing below normal line and 8 years normal and above normal line. The bad years are very bad and good years are close to normal line. If we take average of these 16 years the data will be below average. Is the rainfall reducing in Indian Subcontinent. It doesnt look like Mumbai will get proper pre monsoon rains untill 8th June. Yesterday good rain again in bangalore. My place got 25 mm. Kormangala and HSR layout 55 mm. Yesterday core south bangalore got good rain. Gottigere- Bangalore yearly rain at 296 mm. The rain we are getting right now not added. We are well beyond 300 mm now. WE entered may with 20 mm. So almost 280 mm in 35 days. Great rains. When Pune can get premonsoon rain ?? ?Just waiting and waiting for rain..
Rajesh sir when will it rain in north konkan heavily,still no rains.waiting for your detailed forecast. Hope drought hit areas marathwada, telegana gets copious rains as predicted. Interesting days ahead! !